Steven Moffat was unwilling to provide any details on the role beyond the identity of the actress to play the Doctor’s next companion. Jenna-Louise Coleman is the first actress since Billie Piper to appear full-time as the Doctor’s companion without having previously appeared on Doctor Who, but she has appeared in several other shows. 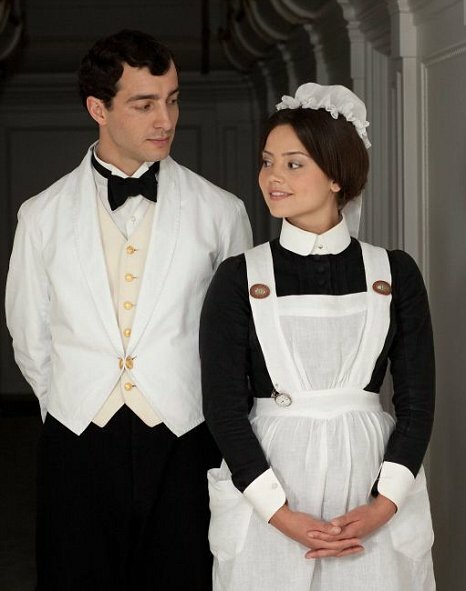 BBC America has posted videos of Jenna-Louise Coleman in some of her previous roles. She is pictured above arriving at the 2009 British Soap Awards. Her first movie role was in Captain America: The First Avenger, playing Connie, one of the girls in the double date early in the movie (picture above). She has a role in an upcoming mini-series about the Titanic written by Julian Fellowes (of Downton Abbey) as cheeky little cockney’ Annie Desmond. There is a twist in this version. Each episode will cover a different group of passengers, and each episode ends with the sinking of the Titanic The show will be on ITV in the UK on April 15. ABC will carry the first three episodes in the United States on April 14 and conclude on April 15. “I had some really good advice from Matt actually, which is to stay off the internet. So I’m going to follow that advice. No Googling – I’m on a Google ban!” she said. Jenna-Louise, who starts filming in May and will make her first appearance in the Christmas Day special, is also looking forward to meeting Karen Gillan, who plays the current companion Amy Pond. “We haven’t met yet. I am potentially going to meet her this weekend so it’ll be great to chat,” she revealed. The actress admitted that she’s trying not to watch any old Doctor Who episodes before she starts shooting. “I’ve seen a lot of them but I’ve decided not to re-watch anything. Then I can go in with a fresh mind. Sometimes subconsciously, you take on what somebody has done before,” she added. Former Doctor Who star David Tennant advised the actress to enjoy the ride. “She’s going on a very exciting journey. I hope she has some good friends to hold her hand because it can be a bit scary when you get thrust into that level of attention, speaking from personal experience,” he said at the UK premiere of his new film, The Pirates! In An Adventure With Scientists. Posted in Science Fiction, Television. Tags: Captain America, Doctor Who, Downton Abbey, Jenna Coleman, Matt Smith. RSS feed for comments on this post.. TrackBack URL.